Digital books are fine. But, honestly, I very much prefer having an actual book in-hand when I game. For all the advantages of quick cross-references and being able to carry a library on your phone/tablet, I still love the physical book being in my hands. If nothing else, I just find the text easier to read on a page than on a screen. So, for me, I'm really happy that the print version of Legacy: Life Among the Ruins is now available from Modiphius. 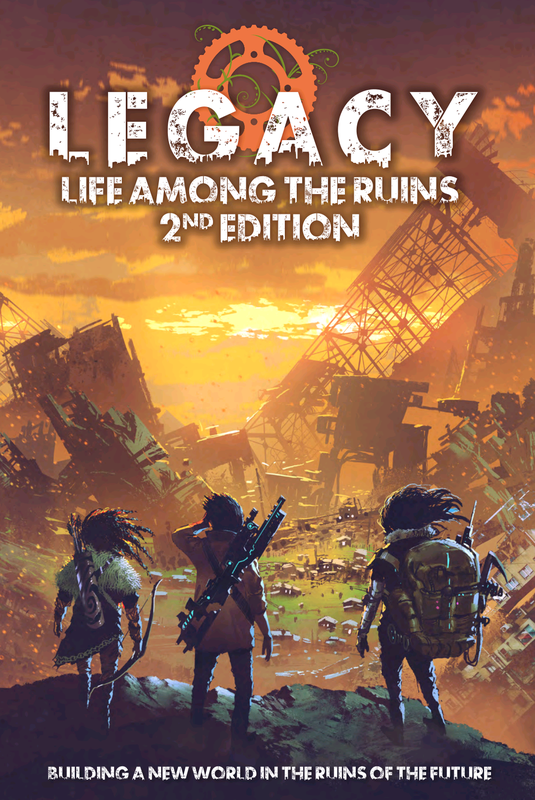 Today we're really proud to announce the full print release of the second edition core book of Legacy Life Among the Ruins, the amazing post-apocalyptic RPG from UFO Press, plus a Legacy Dice Set and Legacy Handout Sheets. All the Legacy Life Among the Ruins titles are available on Modiphius.net and join the recent Worlds of Legacy PDF titles in this ever expanding roleplaying universe. If you'd like to sample this intriguing game world, there's also two free Quickstarts Titanmancy: Legend 2E Quickstart and Non-Compliant to get you going.